என்னே?-இனி உன்னை யான் மறவாமல் நின்று ஏத்துவனே. அம்மையே! மும்மூர்த்திகளின் தாயாக விளங்குபவளே! 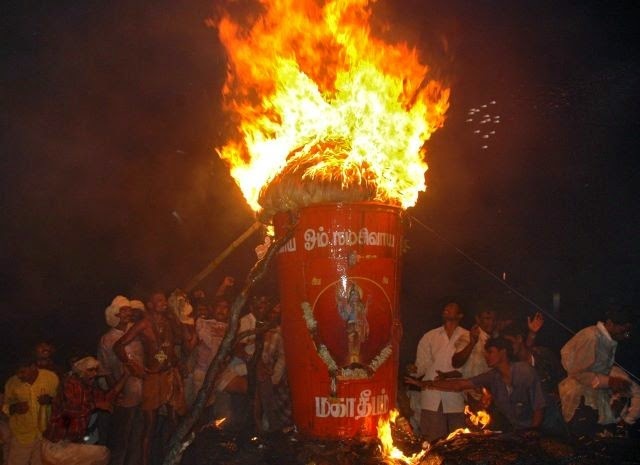 மூவுலகத்திற்கும் கிடைத்த அருமருந்தே! இனி நான் பிறவாமல் இருக்க, முன்னதாகவே தவங்கள் பல முயன்று செய்து கொண்டேன். அதற்காகவே நின் அடியார்கள் பின் திரிந்து அவர்களுக்குப் பணி செய்து வருகின்றேன். அம்மா! அபிராமித்தாயே! நான் முன் செய்த தவப் பயனே, இப்பிறவியில் உன்னை மறவாமல் நல்வழி நின்று வணங்குகின்றேன். 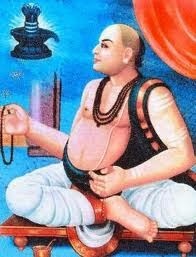 இன்னும் வணங்கிக் கொண்டேயிருப்பேன். enne?-ini unnai yaan maravaamal ninru eththuvane. My divine mother Abhirami! You are the mother of trimoorthis, Brahma, Vishnu, and Shiva. I have done good deeds and penance and followed and served your devotees so that I could get salvation. Due to the good deeds and penance, which I have done in the previous births and in this present birth, I am in a position to praise thee without forgetting and I am morally righteous .The world has got in you, the veritable panacea. பணியேன், ஒருவரை நின் பத்ம பாதம் பணிந்தபின்னே. அபிராமித்தாயே! மணியாக விளங்குபவளே! அம் மணியில் உண்டாகும் ஒளியாகவும் விளங்குபவளே! ஒளி பொருந்திய நவமணிகளால் இழைக்கப்பட்ட அணியாகவும், அந்த அணிக்கு அழகாகவும் திகழ்பவளே! நின்னை அணுகாதவர்க்குப் பிணியென நிற்பவளே! நின்னை அண்டிவரும் பாபாத்துமாக்களின் பிணிக்கு மருந்தாகவும் நிற்பவளே! தேவர்களுக்கு பெரும் விருந்தாய்த் தோன்றும் அன்னையே! நின் அழகிய தாமரை போலுள்ள சேவடியைப் பணிந்த பின்னே, வேறொரு தெய்வத்தை வணங்க மனத்தாலும் நினையேன். paniyen, oruvarai nin pathma paadham panindhabinne. Abhirami! you are the precious gem; effulgence of the gem. You are the jewel made up of bright gems. You are the adornment of ornaments. For those who don't surrender you are plague. You are the panacea to those sinners who approach you. You are the Ambrosia, the food of gods. I will not obey anyone after having bowed to you. After the passing of such a heroic soul like Dhruva, there appeared on thescene, Venan the personification of senseless wickedness. Born in the same line of illustrious kings Venan was the son of king Anga and queen Sumitha. Even as a child, his evil nature showed up. As he grew up his wickedness also grew. The people became desperate and appealed to the king who in desperation banished him to the forest. King Anga was disconsolate and , he too retired to the forest. He did tapas like his forefathers and attained the feet of Lord. The land was without a ruler and soon the effects were seen. Robbers had a field day, roaming everywhere looting and killing. the rishis requested Venan, to resume his kingship. But now he was more arrogant. He proclaimed himself that he alone was to be worshiped and yagnas should be conducted for him only. When several sages came to advise him for his own good, but he was upset and fumed.” spurned their advice, boasting that he alone was the supreme lord on earth, and blaspheming Thee using vile words. The auspicious and celebrated Karthigai Maasam begins this year on November 17th and ends on December 16th. It is the eight month in the tamil year and derives its name from the Nakshatram or constellation of Krithika or Pleiades. 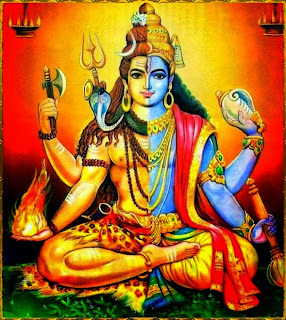 Lord Shiva is the presiding deity of this month and Shiva temples all over India are crowded with devotees practicing vows and oblations to honour and propitiate Him. 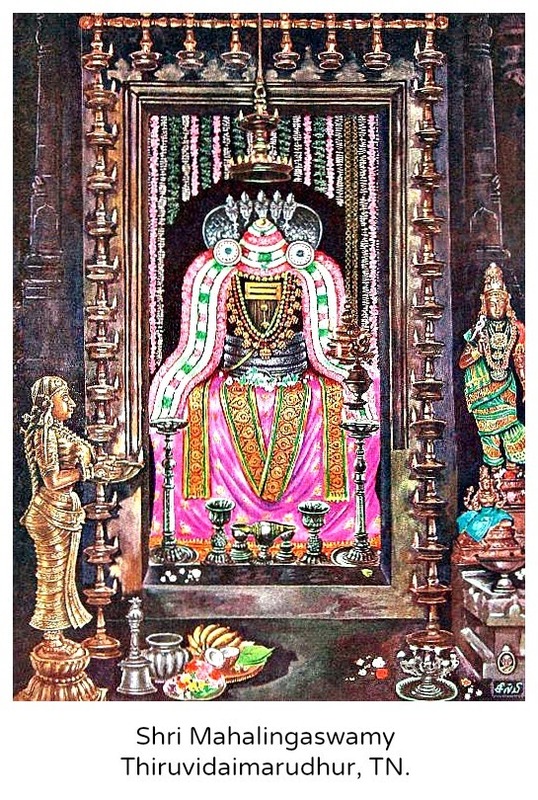 In Tamil Nadu, there is an ancient religious custom which is still followed, that of waking up before dawn and serenading the Lord with melodious chants from the Tiruvempavai, a collection of devotional hymns praising Lord Shiva and bidding him to awaken and glorify the universe with his Light. Moreover, Ayyappa devotees start the 41-day Ayyappa Deeksha Vrittam and make the annual pilgrimage to Sabarimala during this month. கள்ளே, களிக்குங்களியே, அளிய என் கண்மணியே. அபிராமித் தாயே! நின்னுடைய கோலமில்லாத வேறொரு தெய்வத்தை மனத்தில் கொள்ளேன். நின்னுடைய அடியார்கள் கூட்டத்தைப் பகைத்துக் கொள்ள மாட்டேன். உன்னையன்றி பிற சமயங்களை விரும்ப மாட்டேன். மூன்றுலகங்கட்கு (மண், விண், பாதாளம்) உள்ளேயும், யாவற்றினுக்கும் வெளியேயும் நிறைந்திருப்பவளே! எம்முடைய உள்ளத்திலே ஆனந்தக் களிப்பை உண்டாக்கும் கள்ளே! ஆனந்தத்திற்கு ஆனந்தமானவளே! எளியேனாகிய எனக்கும் அருள் பாலித்த என் கண்மணி போன்றவளே! kalle, kalikkungaliye, aliya en kanmaniye! Abhirami! I will not fill my mind with any other thing than with your vision. Besides I will not part company with your devotees. Neither I will like the other faiths and you are present in the inside and outside of all the three worlds. You are so sweet like honey and ecstatic , so dear as the pupil of my eye, and so good as to help this simpleton. King Uttanapada, the son of Swayambhuva Manu, had two wives, by name Suruchiand Suneethi. The king was very fond of Suruchi but ignored by her husband, Suneethi altogether. Having no other support, was helpless. Suneethi took refuge in Thee alone. While Sridhara Ayyawal was staying in Trichy, some greedy neighbours voiced their opinion to the King that Ayyawal was more leaning towards Lord Shiva than Lord Vishnu and he should be put to test. The King who was a great devotee of Ayyaval did not like the idea of testing the saint. However the desire to know the heart of the saint sprouted in him and hence he decided to test Ayyaval without malice and hit upon a plan. He ordered the priests to dress up Sri Mathrubhuteshwara Lord Shiva in Tiruchirapalli as Lord Krishna and take him in procession. He thought that Sridhara Ayyaval’s reaction would indicate his bias. When the procession passed through the home of Ayyaval he was meditating on Lord Shiva. Upon hearing that the procession is nearing his house he came out to see the Lord and found Mathrubuteshwara in the form of Krishna. The King was taken aback on this and all his greedy neighbours fell at the feet of Sridhara Ayyaval and apologized for their ignorance. The King then requested Ayyaval to stay back in Trichy. However Ayyaval politely declinded the offer as that will stop his mission of spreading the divine message to the world. பிடியே, பிரமன் முதலாய தேவரைப் பெற்ற அம்மே. அடியேன் இறந்து இங்கு இனிப் பிறவாமல் வந்து ஆண்டு கொள்ளே. கொடியானவளே! இளமையான வஞ்சிப் பொற் கொம்பே! தகுதியற்ற எனக்குத் தானே முன் வந்து அருளளித்த கனியே! மணம் பரப்பும் வேத முதற் பொருளே! பனி உருகும் இமயத்தில் தோன்றிய பெண் யானை போன்றவளே! பிரம்மன் முதலாகிய தேவர்களைப் பெற்றெடுத்த தாயே! அடியேன் இப்பிறவியில் இறந்தபின், மீண்டும் பிறவாமல் தடுத்தாட் கொள்ள வேண்டும். pidiye, piraman mudhalaaya thevaraip perra amme! adiyen irandhu ingu inip piravaamal vandhu aandu kolle. Abhirami! You are a slender creeper.You are tender Vanji Creeper.You are the fruit, I havc got, even before I deserve it. You are the female elephant born in the snow covered Himalayan Mountains. You are the benign mother begotten Brahma and other demi-gods. I am your servant and save me from Birh death cycles. THE DIVINE TWINS - "NARA & NARAYANA"
We have seen earlier one of the daughters of Swayambhuva Manu. She was Devahuti, mother of Kapila. Yet another daughter of Swayambhuva Manu was PRASUTI. She was married to the son of Brahma-DAKSHA PRAJAPATI.Daksha and Prasuti had 16 daughters. Out of these 16, thirteen were married to DHARMA DEVA. One was married to PITRUS; one to AGNI and another named SATI was married to SIVA. Out of the thirteen married to Dharmadeva ,one was MURTHY by name. She gave birth to the divine twins - - NARA and NARAYANA. These twin brothers were the forms of the Lord and they were always together. Sri Sridhara Ayyaval used to visit the Temple of MahaLinga, Lord Shiva, in the nearby city of Madhyarjuna. Rain or shine, he would not miss visiting the temple. He preferred to see the Lord when there was not much crowd and so chose the early hours of the morning for the visit. While Sri Sridhara Ayyaval was lamenting thus a priest of the Shiva Temple, who was known to him, came to him and gave Vibhoothi Prasada (Sacred ashes). He said to Sri Sridhara Ayyaval, "I did not find you in the temple today. Knowying that you would be saddened at not being able to cross the river and have the vision of the Lord I decided to come and give you the sacred ashes." Transported to Bliss Sri Sridhara Ayyaval prostrated before the priest and accepted the sacred ashes with reverence. While Sri Sridhara Ayyaval moved towards his home, shedding tears of joy thinking of the love of the Lord towards His devotees, the question 'how did the priest manage to cross the flooded river?' arose in him. From his memory he recalled that the priest was not a bit wet and the sacred ashes smeared on his body were not sumdged! Sri Sridhara Ayyaval wondered if it was Lord Shiva himself who had come in the garb of the priest. Next day, the flood subsided and Sri Sridhara Ayyaval went to the temple and found the same priest there. Sri Sridhara Ayyaval thanked the priest for his kindness and said that his mind was at peace only after receiving the sacred ashes from him the previous day. The priest was utterly confused hearing this. He said, "Sir! I never came to the other shore! Indeed, who could have dared to cross the flooding river?" On hearing this, Sri Sridhara Ayyaval was moved beyond words. He realized it was Lord Shiva himself who had taken pity on him and come to give the sacred ashes. With a grateful heart he sang the glory of the compassion of the Lord in the hymn 'Dayashatakam'. In this hymn, he sings, "Oh! The Compassion of the Lord! One is cleansed of all his sins the moment you cast your glance on him! When will you bless me so that I will always be immersed in the bliss of chanting the Divine names like 'Madhava', 'Murari', 'Kaamaarey', 'Shiva', 'Mahadeva', 'Govinda' and 'Purahara'! Be pleased to bestow two boons on me! That my mind may always be established in the Divine Form of Lord Shiva and that my tongue may always chant the Divine Names! In my last breath, let me chant the Divine Name 'Shiva'!" Sri Sridhara Ayyaval, who composed 100 such verses glorifying the compassion of the Lord, was none other than Lord Shiva himself! Needless to say, he was an epitome of compassion! He could not bear to see anyone suffer. He considered even liberation a trifling matter as compared to compassion to all beings. One day, while Sri Sridhara Ayyaval was on his way to visit the temple of Lord Shiva, he discoursed to his devotees emphasizing the glory of divine names and love for the Lord. Sri Sridhara Ayyaval looked unusually bright and lustrous that day. In the sanctum sanctorum of the Lord, with tears in his eyes, he prayed to the Lord through many verses. Overwhelmed by the pangs of separation from the Lord and unable to stand it any longer, Sri Sridhara Ayyaval rushed to the Sanctum of the Lord in order to embrace Him. While the priests attempted to stop him Sri Sridhara Ayyaval ran and disappeared into the Sanctum of the Lord. The Lord, in the form of Linga, shone brightly like a sun for some time. The awestruck devotees stood looking on, as this wonderful incident happened, and shed tears. 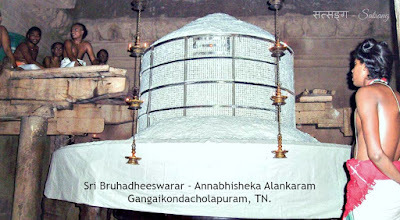 Annabhishekam is held on full moon day in the seventh month of every year - i.e. Iyppasi (Tamil calendar) Asvini (Hindu calendar) (October/November), for Shivalingam, presiding deity of all Shiva Temples in South India. Devotees believe that performing annabhishekam to the Lord on this day would rid them of all their problems. பிங்கலை, நீலி, செய்யாள், வெளியாள், பசும் பெண்கொடியே. அம்மா அபிராமி! என்றும் பசுமையான பெண் கொடியாக விளங்குபவளே! என்றும் சுமங்கலியே! செங்கலசம் போன்ற தனங்களையுடையவளே! உயர்ந்த மலையிலே உதித்தவளே! வெண்மையான சங்கு வளையல்களை அணியும் செம்மையான கரங்களையுடையவளே! சகல கலைகளும் உணர்ந்த மயில் போன்றவளே! பாய்கின்ற கங்கையை, நுரை கடலைத் தன் முடியிலே தரித்த சிவபெருமானின் ஒரு பாதி ஆனவளே! என்றும் பக்தர்களையுடையவளே! பொன் நிறமுடையவளே! கருநிறமுடைய நீலியே! சிவந்த மேனியாகவும் விளங்குகின்றவளே! Abhirami is ever married to my Lord. She is red conical breasted. She is the daughter of the mountain king. She has a red hand wearing bangle of white conches. She is all knowing peacock. She is part of Siva who wears the froth-loaded Ganges on his head. She has possessed me. She is golden complexioned. She is black. She is reddish. She is like space (no color). She is like a green tender creeper.